Right, tax increment financing is totally “more private” funding! Except for how it actually lets businesses take back their own property tax payments and spend them on private projects, to the point where the Milwaukee Bucks owners are collecting interest on a loan they made to themselves using their own property taxes. That will surely poll better — not that the Indiana poll seems to have asked anyone if they’d prefer a TIF, but we don’t need to bother busy regular folks with details like that, now do we? This entry was posted in Indiana Pacers, Indy Eleven by Neil deMause. Bookmark the permalink. “Indy Eleven” is their actual name?! Not some placeholder until something better gets selected? I knew they were running out of cities to put these soccer teams but I didn’t realize the pool of decent names had also ran dry. Well, they wanted to name them after their projected average home paid attendance, but “Indy 500” was already taken. I’m all for improvement districts and funding related to the use such as entertainment taxes, etc. Make the people either involved in or benefiting from this use be the ones paying for it, and make the owner responsible for any funding shortfall. These entertainment districts/improvement districts make sense in areas that need the extra push, and can cause spillover that causes surrounding areas to get better and contribute more tax dollars because of it. The problem is that it seems that very few people in charge of these deals or in charge of running or building these districts seem to understand economics or market saturation. In most places, an arena should be part of a tourism district with those cheesy chain restaurants as opposed to an entertainment district with clubs in the case of say LA or another megacity where nightlife of that kind is important. You have to know your audience and know what your market can actually support. Furthermore, not every type of sporting venue can support every type of surrounding business or development. This is obvious even in the organic districts that people agree work such as Wrigleyville and Fenway. Imo the only type of venue that can actually support real ancillary businesses to the point of having an actual district is an arena due to its role in hosting various events year-round. Both families and young people can go there to see a show or a game or something and grab dinner or lunch or do any number of things as part of a day or night out. However, this doesn’t really work unless it’s part of or adjacent to an existing center of activity because people and especially families don’t want to walk around and spend time in an area they don’t personally know or know to be safe. This makes creating a new district around an arena either a huge giveaway and a waste of an area that would have developed anyway or a huge gamble on an area that has no guarantee of succeeding. The sweet spot of finding an area close enough to existing centers of activity that would otherwise not likely develop but where this extra push can pay dividends is extremely rare and more than likely the city goes out too far on a limb on a risky area and it takes a long time to develop into anything real. The biggest problem with any kind of stadium deal is there are very few places where land is so undervalued that it makes sense to sell it cheap or create a district yet that has the potential to work and fund itself in the long run let alone in the short term. I don’t know Indianapolis or the soccer stadium plan well enough to say whether or not that would even be possible in their case but the city at the very least needs to put their foot down with the Pacers. TL;DR version is basically these deals are often made by people who have absolutely no clue what is actually possible and whether or not it would be possible without the extra incentives. 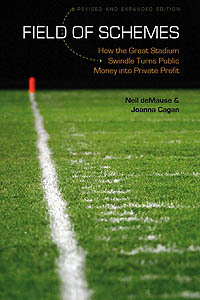 It is definitely ideal to make subsidy packages consist entirely of things related to the deal such as entertainment taxes, taxes on purchases at or related to the stadium or team, and in some cases a district or discounted land -but only in cases where the land would otherwise not likely be developed or contribute to taxes but has a good chance of doing so successfully with the right incentives. Unfortunately, those cases are extremely rare and should be scrutinized the same way a developer scrutinizes a potential site purchase but seemingly very rarely are. It’s actually worse than that, because if a subsidized development ends up cannibalizing economic activity that would otherwise go somewhere else in your city, even land that otherwise wouldn’t be developed can be a waste of a TIF. But yes, the “but-for” issue is the main problem with them.